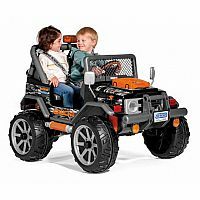 The Gaucho Rock’in is the perfect riding vehicle for kids who want to create an adventure! They’ll climb in, buckle-up their seat belts and cruise around the yard in style; with their friend beside them, listening to the radio. 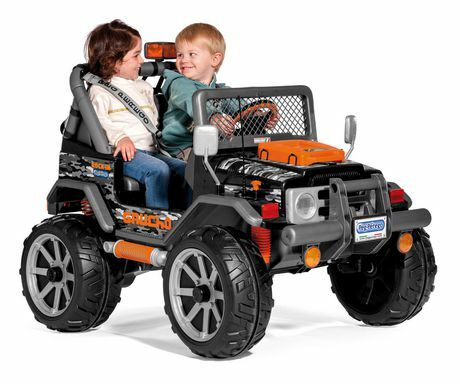 Includes rack and pinion for easy steering and rear suspension springs for a smooth ride.The 2-speed shifter with reverse allows them to drive at 2½ or 5 mph on grass, dirt or hard surfaces. Parents will appreciate the 5 mph lockout that prevents beginners from going too fast. 12-volt rechargeable battery and recharger included. Made in Italy. 12V - 2 speeds forward -1/2 and 4-1/2 plus reverse. Includes play tool set. Two seats. Assembled and serviced by Stevenson's.